France remain unbeaten and travel to Cardiff in a fortnight looking for a third straight win. Little was expected after a turgid first-half affair, with kickers from both sides, Jean-Marc Doussain and Tomasso Allan profligate from the deck early on. The second-half was better as France showed ambition, scoring three tries in nine minutes between the 45th and 51st minute to rouse the Stade de France. First it was No 8 Louis Picamoles bolting from a maul to power. Minutes later, Wesley Fofana picked up from the base of a ruck to scamper down the wing to score, and finally debutant Hugo Bonneval finished off a classic French move started by Fofana and finished off by debutant Hugo Bonneval. With 10 minutes to go the game took a murkier turn as both Rabah Slimani and Michele Rizzo were shown red to become the first duo to be sent off since 1992. With France down to 13 men, with Vahaamahina in the sin-bin, Tommaso Iannone snuck in late on to give the scoreline a modicum of respectability. – France made eight clean breaks and beat 20 defenders, compared to Italy who made three clean breaks and beat 18 defenders. 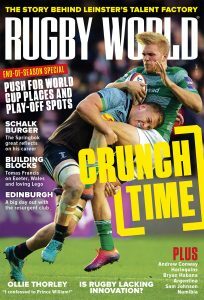 – Bernard Le Roux, the French openside flanker left the field with a head injury and will be assessed by the medical team. 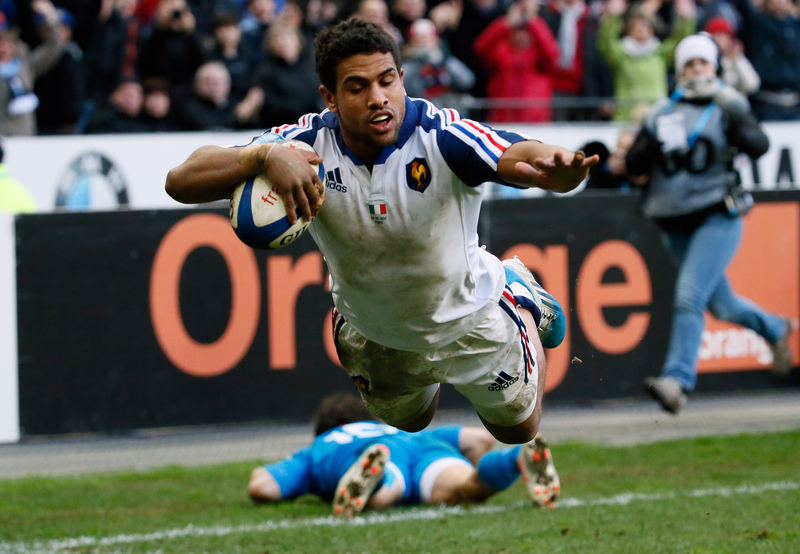 – France will have been buoyed by three tries in six minutes but they were pretty ordinary outside that flurry. 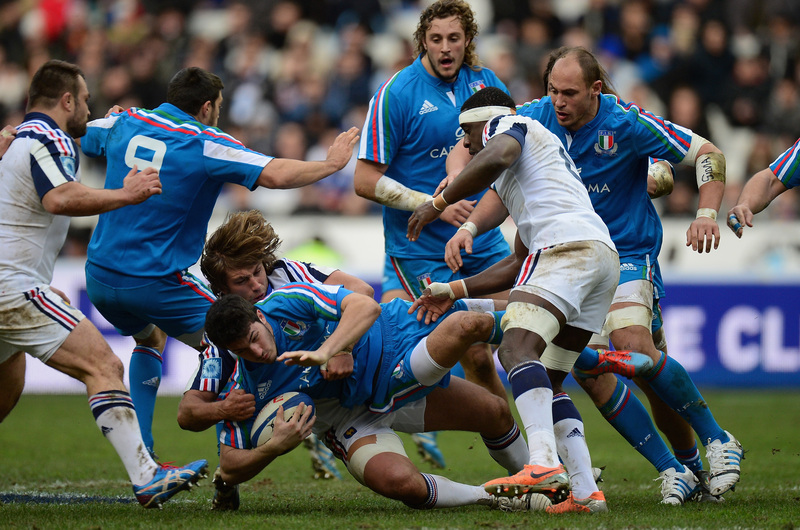 The French pack will not have enjoyed being driven backwards by Castrogiovanni and a grizzled Azzurri pack in the first-half and even though they improved in the after the break they will know they will need to improve against a fired up Welsh front-row. – Italy, without being outplayed, still ended up on the back of a 27-point loss. 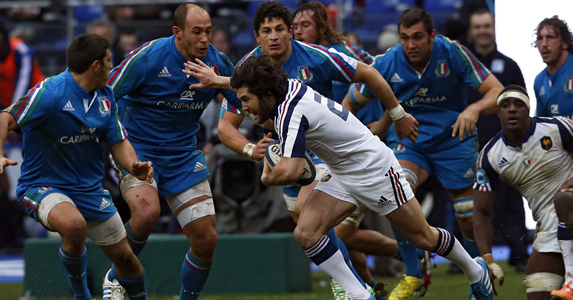 Despite Jacques Brunel purporting to play a more expansive game, it was only in the last few minutes, when France were down to 13-men that Italy managed to dent the French defence. They need more guile and ambition outwide if they are to match last year’s two wins. Allan has looked a little green for international rugby so the experienced Orquera comes in to boss the try-shy backs. He is accompanied by Tobias Botes who looked sharper than Edoardo Gori. In the pack, Alessandro Zanni returns after a broken nose incurred against Wales.